With the Edinburg campus this fall bustling with action, including more than $150 million in ongoing and planned new construction, key city leaders are praising the landmark advances that highlight the historic first semester of The University of Texas Rio Grande Valley. García, who also serves as a member of the Edinburg Economic Development Corporation Board of Directors, said that a revolution is taking place at the 318.1 acre local campus (with plans by the UT System to soon expand by another 53 acres) that deserve constant and deserving attention. Throughout its history, Edinburg Junior College, which then would become Pan American College, Pan American University, UT Pan American, has had many of the best students, faculty, and athletic and academic programs in Texas, the mayor recalled. “The unprecedented growth that is unfolding before our very eyes is a direct result of the vision, determination, hard work, and incredible successes of the huge number of graduates, citizens, and leaders who, for the past 88 years, have built the powerful foundation which will always support The University of Texas Rio Grande Valley,” said García. Iglesias said UTRGV, which also has campuses in Brownsville, Rio Grande City, Harlingen, McAllen, and South Padre Island, draws considerable positive attention to deep South Texas and its people. “In its first semester, UTRGV registered almost 29,000 students Valleywide, with Edinburg being the largest component, both in physical size and enrollment, of any university south of San Antonio,” said Iglesias. “That figure places us among the top 10 largest student enrollments among Texas universities. According to UTRGV, the Fall 2015 total student enrollment among its campuses are is 28,583. Iglesias said UTRGV – and its predecessor institutions, UT Pan American in Edinburg and UT Brownsville, which were brought together to become UTRGV – benefit from a deep and talented pool of students from deep South Texas. On Tuesday, September 15, 2015, officials with the Texas A&M University System, the City of McAllen and Hidalgo County took the first steps today to expand Texas A&M’s presence in the Rio Grande Valley and create new higher education options for students. Under the letter of intent, all entities agree to the creation of a teaching facility on approximately 100 acres of land within the Tres Lagos development on the north side of McAllen. Tres Lagos is a 2,571-acre planned community located in McAllen’s extraterritorial jurisdiction. The City of McAllen, in conjunction with Hidalgo County, is offering the 100 acres, plus $10 million towards a teaching facility and $8 million to install utilities and infrastructure. Texas A&M will seek the necessary approvals to provide academic programs such as engineering, engineering technology, biomedical sciences, and agriculture and life sciences as well as helping to fund construction costs associated with building the teaching facility. Courses will be taught by Texas A&M faculty and graduates will receive the iconic Aggie ring. The goal is to open the facility by 2017 with 100 students, but expand to 750 students over five years. UTRGV MEDICAL SCHOOL, WITH MAJOR CAMPUS IN EDINBURG, EARNS KEY ACCREDITATION – MAYOR PRO TEM HOMER JASSO, JR.
Just weeks after UTRGV officially opened its first fall semester, more outstanding news came to Edinburg and the Rio Grande Valley, said Mayor Pro Tem Homer Jasso, Jr.
On Friday, October 16, 2015, the University of Texas Rio Grande Valley School of Medicine announced it is now recruiting its inaugural class of students, after receiving preliminary accreditation from the federally recognized Liaison Committee on Medical Education (LCME). The LCME designation allows the UTRGV School of Medicine to function as a medical school and implement its academic programs and curriculum. Scheduled to open in Fall 2016, the UTRGV School of Medicine plans to enroll 50 students into its charter class. In Austin and in Washington, D.C., the Edinburg City Council and EEDC, through its legislative teams and direct involvement, coordinate with state lawmakers and UT System leaders to actively promote policies and actions “that champion the cause for UTRGV and its School of Medicine, Jasso added. Mayor García said UTRGV President Guy Bailey has met the highest expectations that come with being president of a major university such as the University of Texas Rio Grande Valley. First and foremost, Bailey is dedicated to the future of the Edinburg campus, and “the proof is in the pudding,” said Mayor García. 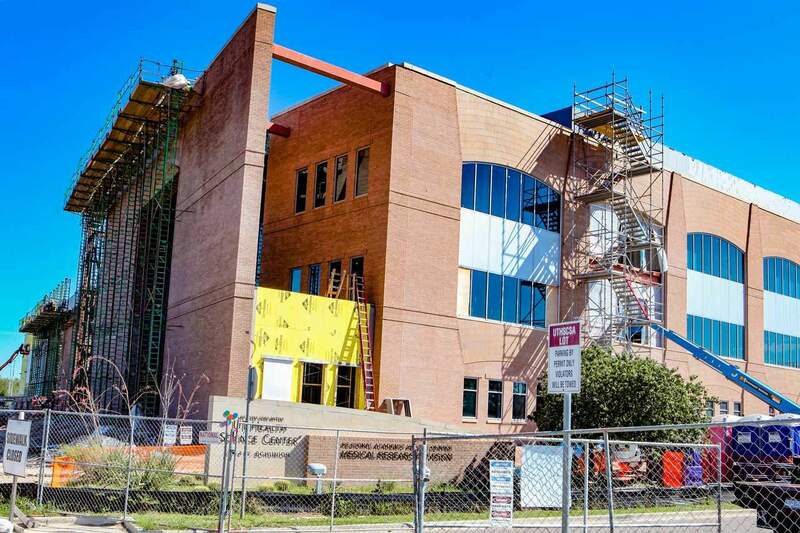 Meanwhile, work continues of the construction of the $54 million UTRGV School of Medicine Medical Education Building, and the Texas Legislature last May approved the financing of a $37.6 million Interdisciplinary Engineering & Academic Studies Building. The UT School of Public Health Brownsville Regional Campus – which was created when the Regional Academic Health Center in Edinburg and Brownsville were established by the Texas Legislature (Senate Bill 606 by Sen. Eddie Lucio, Jr., D-Brownsville, and Rep. Juan “Chuy” Hinojosa, D-McAllen) – remains part of The University of Texas Health Science Center at Houston. UTRGV was created by the Texas Legislature in 2013 in a historic move that brings together the resources and assets of UT Brownsville and UT Pan American and, for the first time, makes it possible for residents of the Rio Grande Valley to benefit from the Permanent University Fund — a public endowment contributing support to the University of Texas System and the Texas A&M University System. That legislation was Senate Bill 24 by Sen. Juan “Chuy” Hinojosa, D-McAllen, and Rep. René Oliveira, D-Brownsville. With Hinojosa as the lead author, SB 24 also included Sen. Eddie Lucio, Jr. D-Brownsville, Sen. Judith Zaffirini, D-Laredo, and Sen. Kel Seliger, R-Amarillo, as authors. Oliveira served as the lead sponsor for SB 24, along with Rep. Dan Branch, R-Dallas serving as sponsor. Rep. Terry Canales, D-Edinburg, Rep. Sergio Muñoz, Jr., D-Mission, Rep. Armando “Mando” Martínez, D-Weslaco, Rep. R.D. “Bobby” Guerra, D-McAllen, Rep. Óscar Longoria, D-La Joya, Rep. Eddie Lucio, III, D-San Benito, and Rep. J.M. Lozano, R-Kingsville, served as cosponsors.